Impass Falls is one of those unparalleled sights. After shooting through rock flumes and racing through rock-choked channels, East Rosebud Creeks falls down a steep bank for perhaps 300 feet. The trail passes not far from the falls. 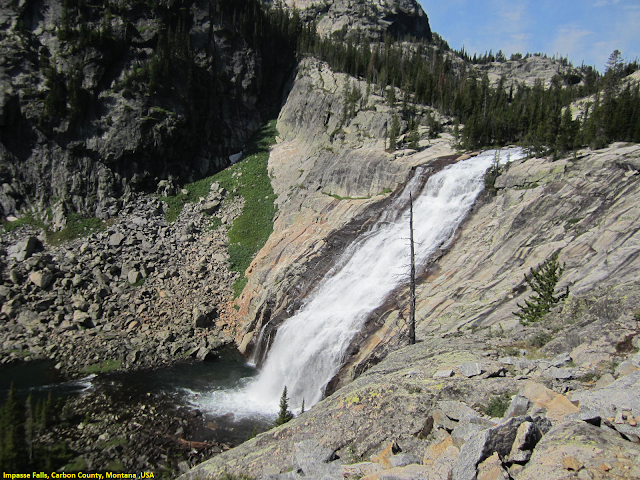 Impasse Falls is the main water source for Duggan Lake in the Beartooth National Forest. You can catch this view on the Beaten Path trail. The Beaten Path is a 26 mile hike that takes you from Cooke City to Rosebud, MT. As one of the prettiest hikes in the country, the Beaten Path takes you up and down a summit along cascades.